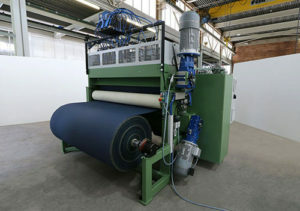 The roll slitter type RSEB with its two drives is a powerful machine for slitting flexible and coated jumbo rolls with a width up to 1650 mm. The machine is able to cut materials with up to 20 cuts simultaneously and guarantees an efficient changeover thanks to its new knife system type PK. Roll width up to 1650 mm (maximum working width 1600 mm). Unwind station for rolls up to ø750 mm (optionally up to ø1250 mm). Pneumatic knife system type PK (alternatively mechanical knife system type KK). Variable speed drive up to approx. 60 m/min. – Main drive for cutting cylinder 7.5 kW. – Additional drive for rewinding 4 kW. Magnetic powder clutches for web tension adjustment. Rewind station for rolls of maximum ø600 mm. Unwind station for rolls up to ø750 mm (optionally for rolls up to ø1250 mm). – with pneumatically expandable unwind shaft for cores with ø75. Unwind station for rolls up to ø1250 mm. Pneumatically expandable unwind shaft ø73 mm. Automatic and contactless brake control type AV. Automatic edge guiding system (with servo drive – no hydraulic system). Pneumatic knife holder type PK-30-P for efficient changeover thanks to its pneumatic clamping system (3 or 4 stage cylinder with 160 kp respectively 210 kp). Cutting pressure is adjustable by a regulator (individual pressure regulation on request). Each knife can be switched on or off on its own. Cutting cylinder axially movable by hand (for optimal use). Further information can be found on the separate page for knives, knife holders and fixed knife sets. Mechanical knife system type KK instead of pneumatic knife holder type PK-30-P. Maximum rewinding up to ø600 mm. Rewinding with two swiveling, pneumatically expandable rewinding shafts for cores with ø75 mm and slots for winding without sleeve. Reversible rewind drive for winding with grain outside or inside. Unwind station with automatic edge guiding system (with servo drive – no hydraulic system). 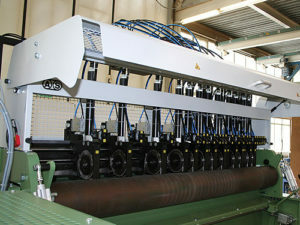 Automatic length measuring device to stop the machine after the pre-selected length is reached. 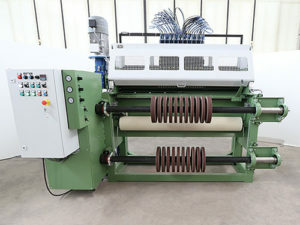 Safety devices like light curtain on unwind as well as rewind side and safety fences on both sides of the machine (necessary for CE conformity). Further information for knives, knife holders and fixed knife sets. Knife holder trolley type MMW for all common mechanical knife holder typ KK as well as fixed knife sets.